Shame is an extremely human, primitive emotion that everyone has experienced. It’s an intensely painful feeling that we are unworthy of love and belonging. Talking about what makes us feel shameful is difficult to do, especially when you feel like others won’t understand. At Safe Connections, we recognize that survivors of domestic and sexual violence experience shame in a very unique way, which is why we are introducing a 12-week adult therapy group based on Brené Brown’s best-selling book, I Thought It Was Just Me (But It Isn’t): Telling the Truth About Perfectionism, Inadequacy, and Power. 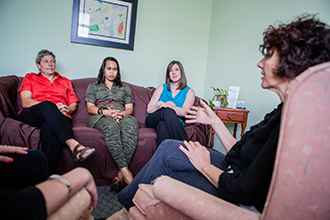 The group, named Connections, will help to define shame, expose triggers and vulnerabilities, practice empathy, and overcome shame by reaching out to others and building connections. Brown, a research professor at the University of Houston Graduate College of Social Work, has spent the past thirteen years studying vulnerability, courage, worthiness, and shame. For a quick glance at Brown’s work, check out this short video, where she and Oprah discuss what environments can foster shame and what is necessary to overcome it. The group will meet on Tuesdays from 10:30 a.m.-12 p.m, beginning on September 8. Due to the content, all participants must be attending or open to enrolling in individual therapy at Safe Connections or another agency of the client’s choice. Interested in joining the group or have questions? Contact Megan at 314.646.7500 x. 141.